Postcards From The Smokies » They Came to Slay the Dragon. And the Dragon Won. They Came to Slay the Dragon. And the Dragon Won. Motorcyclists from all over the world come to the Smokies to “slay the Dragon”, the infamous stretch of US Highway 129 at Deal’s Gap in western Swain County, NC. With 318 curves in just eleven miles, the Dragon is considered by many as one of the best motorcycling and sports car roads in the world. 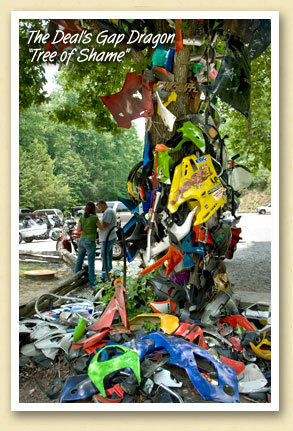 At the Deal’s Gap Motorcycle Resort, the “Tree of Shame” is covered with broken parts and pieces of the bikes that crashed on the Dragon — a makeshift shrine to those who faced the beast …and lost.